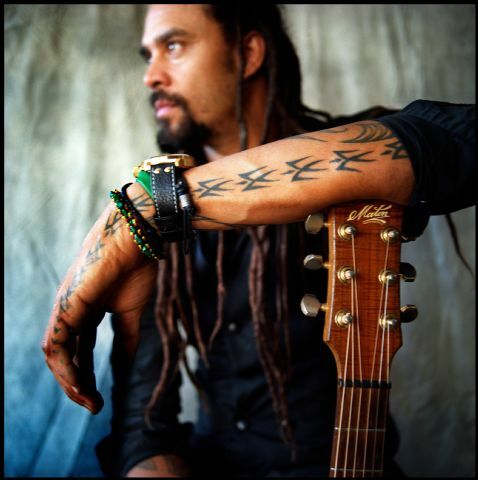 Sitting on the bus an hour before he takes the main stage at Harmony, Michael Franti looks out the window overlooking the gathering crowd and reflects: "I've been living on a tour bus for the last 20 years and it used to be you'd stop at a truckstop in the middle of the night and there was nothing to safe to eat. Now you stop and there's bio-diesel everywhere. For better or for worse, Whole Foods as a chain is everywhere. Wal-Mart now sells organic food. These ideas that were once only here at this festival are now mainstream." We move on to gas prices, the timber industry, Obama's listening skills and the fact that he can "still dunk at 43." But when we really get to the heart of the matter, it's a story about the morning he spent in Woody Harrelson's bathroom, writing "Say Hey (I Love You)" - his biggest single to date, a catchy little ditty that recently topped the 120,000 mark in digital sales. "And then Woody called me and said, 'Hey, what are you doing?'" "I wrote it in the steam on the mirror and then I got out my camera and took a picture of it before the steam evaporated and then later I had to flip it over in Photoshop." "So I told him, 'I'm sitting here on your toilet,' and all he wanted to know is 'Is it a Number 1 or a Number 2?'" Right now, it's a Number 84 in the Top 100 Billboard singles.